Homemade dinner rolls simply "make" a comfort food meal. Back in the day, when I was better at multi-tasking, I baked my dinner rolls at the last minute. But these days I bake them as much as a month ahead and freeze them until 2 1/2 hours before serving time. Of course, you can just go ahead and serve these the day you bake them; but I've included instructions for freezing, thawing and reheating. Sometimes I make other kinds of rolls. 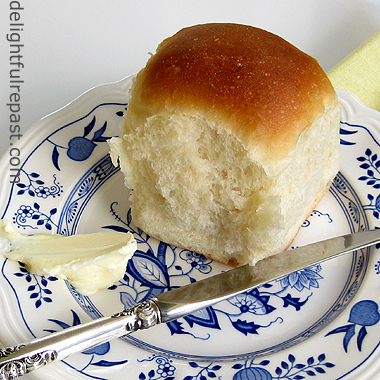 I love them all; but these big, fluffy, pull-apart rolls have been my go-to roll for decades. And I think the fact that they have butter, oil, sugar and egg is what makes them stand up to freezing so well. If, unlike poor little me, you have a heavy-duty stand mixer (I know it must be shocking to find a food blogger who does not! ), you can easily adapt my recipe for the mixer. I make all my bread by hand, though I am beginning to think I might need to break down and get a mixer for those days when I'm feeling a little less insistent on doing things the traditional way. When it's warm, and my house is warm, I let bread dough rise on the counter. In fall and winter, I keep a cooler house than many people do and find that dough takes much longer to rise. So the old slightly-warm-oven method helps hurry things along. Are you a breadaholic like me? Please comment; I'd love to hear about your bread preferences and experiences. 1 If your kitchen is cold and you want to speed up the rising time, preheat oven to 200 degrees. When oven reaches 200 degrees, turn it off. (If you have a really old pre-electronic ignition gas oven, just the heat from the pilot light will be sufficient.) Grease large bowl* with 1 tablespoon of softened butter (for first rise). Grease 13x9x2-inch baking dish with 1 tablespoon of softened butter. *Using a straight-sided 4-quart bowl makes it easy to tell when dough has doubled. 2 Put water, oil and 3 tablespoons butter in 1-quart glass measure. Microwave on high power until water is warm (110 to 120 degrees), about 2 minutes, depending on your oven. Stir until all the butter is melted. 3 In another large bowl, whisk together 4 1/2 cups flour, sugar, yeast and salt. Make a well in the center of the flour, then add water mixture and egg to the well. With dough whisk or large wooden spoon, slowly stir until soft, shaggy dough comes together. 4 Spread 1/2 cup of flour onto work surface, and reserve 1/2 cup to use as needed. Turn the dough out onto floured surface and knead for about 10 minutes, adding more flour if needed, until the dough forms a smooth ball. Place smooth ball of dough in buttered bowl and turn to coat all sides of dough. Cover bowl with plastic wrap and place in oven until dough has doubled in size, about 1 hour. If the oven rack feels quite hot, put a potholder between it and the bowl. 5 Punch dough down (by pressing down in center and folding in edges), turn out on lightly floured surface. Divide* the dough into 15 equal pieces by first dividing it into 3 equal pieces then rolling each piece into a thick log and cutting each log into 5 equal pieces. Keep dough pieces covered with plastic wrap or overturned bowl as you shape each piece into a ball, pulling edges under and pinching them together on the bottom. I also give them a little roll on the unfloured counter, a motion sort of like moving a computer mouse around. Place in 3 rows of 5 in buttered baking dish. Spray the same piece of plastic wrap with cooking spray, cover dish lightly and return to turned-off oven until rolls have doubled in size, about 1 hour. 6 Remove dish from oven and preheat oven to 375 degrees. Uncover rolls and bake for 25 minutes, or until well browned. Remove from oven and cool on wire rack for 5 minutes. Keeping rolls together, remove rolls from baking dish and cool on wire rack for 2 hours. Double-wrap with foil (probably one layer of heavy-duty would be sufficient); freeze for up to 1 month. 7 Remove from freezer 2 1/2 hours before serving time. Defrost, wrapped, at room temperature for 2 hours. During last 15 minutes, preheat oven to 375 degrees. Place foil-wrapped rolls on a cookie sheet and bake about 30 minutes. Serve hot. *The best tool for dividing the dough (and doing a lot of other jobs) is a bench scraper. If you don't have one, order the OXO Good Grips Multi-Purpose Pastry Scraper/Chopper. I've had a few others, and this one is the best, has THE best handle! I make my bread by hand too - but they never look as neat as yours. Ann, that is so sweet! Mine probably look so neat because I get a little nit-picky about getting them all the same size. I even get my handy-dandy kitchen scale involved! But, you know what? They all -- neat or not -- taste the same, and that's the only thing that really counts! I'm going to try your recipe. My mother made buns that looked just like that. She baked buns and caramel pecan rolls every Saturday morning. We must all have been breadaholics at that time! Wheat doesn't favor me, so I eat very little of it. But the wheat I do eat, I'd spend on a bun like that or a slice of homemade bread! How cool is that, Judy! Your mom's table! Yes, you definitely need to make these rolls. I try to eat "healthy" and not eat much "fluff," but I am definitely a breadaholic and willing to save my splurges for some good homemade bread! Those rolls look absolutely delicious! I'm going to figure out a dinner plan and make them! 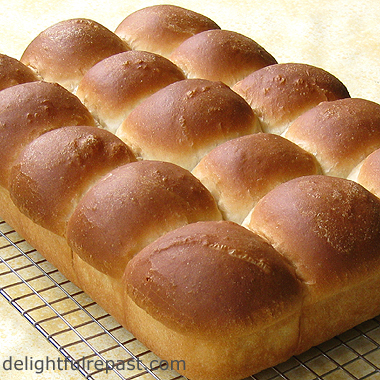 Even though my family is mostly anti carb, I'll have to make these yummy looking rolls for a treat sometime soon and I know they won't be able to resist! Richard, I understand "anti carb" and I feel I can make exceptions for such things as these rolls because I don't waste my self-imposed carb allowance on store-bought junk. If a food is not something particularly nutritious, I ask myself "Is this worth going off the wagon for?" I hope you enjoy these rolls as much as we do! Hi Jean..can u plz share which brand of yeast u r using...is it fresh yeast or dried one?...I live in India and i get mostly dried active yeast...thanks in advance. Hello Nive, I use Fleischmann's. You can buy it in the little envelopes, which come three to a package; and it's called Fleischmann's RapidRise yeast. But I buy it in the 4-ounce jar (equal to 16 envelopes); and in the jar it is called Fleischmann's BreadMachine yeast, though it is exactly the same as RapidRise. Once you open the jar, you should keep it in the refrigerator. Hope this helps. Oh, oh, oh! I've been wanting a good roll recipe for ages. The ones in my books often leave us unsatisfied. We're big roll eaters here in KY. They are part and parcel of a good dinner, and my family sighs without them. Yep, my father grew up in the Southern tradition of bread on the table at every single meal. My mother found that amusing, took her years to adjust to it! There could be a dozen delectable dishes on the table, and he'd sit down and say "Where's the bread?" You used to be BETTER at multitasking? Piffle, how can that be? Piffle, I say. All this accumulated wisdom and lore on top of your burgeoning writing career cannot be a simplification or a slowing down. And I have to confess that the photo of what I call Parker House rolls that you posted made me want to lick a stick of butter (margarine). Yes, I know I've badmouthed bread in the past, Mdm. Breadaholic, and it's true that I only make dough when I want something that will pick up slivers of glass, but I can smell the damp doughiness of your latest, and it is a vehicle for butter after all. Usually when I see a pan of Parker House rolls it reminds me of the south-side view of lines of cancan dancers backing into the limelight. But this time I thought of BUTTER! Am I losing it, or is butter better? Do your photos need to be rated…raided? I place your latest in the iconic category of Red Lobster crab biscuits, Outback's Russian bread, and DisneyWorld's New England rolls with honey-apple butter! Wow, high praise! It's a good thing I didn't post a photo of the risen rolls *before* they went into the oven! "Lines of cancan dancers backing into the limelight," indeed! Wow, those are some seriously impressive looking rolls Jean - so "pro"... like, really. They look like some rolls sold in a bakery near me and they're *good*. They look so springy and fluffy and delicious. I can imagine they'd be perfect with a bit of cheese, ham and mustard in between too! Thanks, Charles! About the butter, you might prefer to go by weight. You see, here in the US you buy butter by the pound. A 1-pound (16-ounce) package contains 4 "sticks" each weighing 4 ounces. There are 2 measuring tablespoons in 1 ounce. So if, for example, you needed 2 tablespoons of butter, you would simply cut off 1/4 of the "stick;" 4 tablespoons, 1/2 of the "stick." Does that help you at all? Thanks for visiting my blog, Jean! Now I get to see all the yummy stuff you make :) I love to bake bread and have cinnamon rolls rising as we speak. Your rolls look just perfect! I'm in Montana, so I always use the pre-heated oven to rise the dough. Have company coming for dinner, so will add you to my feed and take my time going thru your blog tomorrow! Karen, thanks so much! I'm glad I don't have company coming for dinner tonight. Guests always expect great things from me, and I'm afraid this might just be a Grilled Cheese Night! On store-bought bread, at that! FoodEpix, thanks so much! I might do that as soon as I figure out how to add one more teensy little thing to my schedule! Nesrine, thanks! I hope you'll try the recipe soon. Thanks, Ann! Hope you enjoy them as much as we do! Aw, thank you! I do hate inadequately browned rolls! Oh, this looks so good! I wish I could eat gluten. I would bake these tonight and they would be gone by lunch tomorrow. Thanks, Julianne. I'm going to be developing a GF version soon, so watch for that! In the meantime, I hope you'll go to my Recipes page on the navbar and check out some of my other GF recipes. I JUST made these for my family Christmas dinner and had to sneak one ahead of time. They turned out perfect! I did, however use my stand mixer. Wisked the dry ingredients 1st then added the wet and mixed with the dough hook until it came together. Otherwise, followed your post to a "T". Davela, thanks so much for letting me know! I'm so glad my recipe worked well for you. 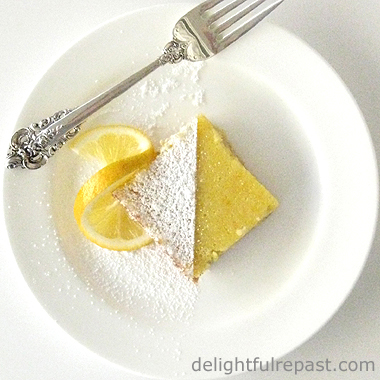 Can you substitute active dry yeast for instant yeast in this recipe? I started making the recipe and realized I don't have instant yeast! Sure can, Lisa. Same amount, too. Let me know how you like them! Nice recipe, but must mention that even if canola oil is organic, it is still genetically modified. "Spectrum uses no GE canola whatsoever. Prior to use, we test all Spectrum canola seed and oil at a third party lab, which verifies non-GE status through sensitive DNA analysis. Because organic certification agencies prohibit GEs, Spectrum Naturals Organic Canola Oil is by definition non-GE, but we test its seed and oil to eliminate the small (but growing) possibility of wind drift contamination from GE fields." I do trust that company but would be careful of other brands of organic canola oil. I really think avoiding GMOs is one of the most important things we can do for our family's health. Thank you again! Rachel, thank you so much! I hope you *will* try them soon. I almost made them today, but then unexpected company happened!